Ruby in Zoisite and Peridot earrings, bracelet, necklace and close-up of necklace. 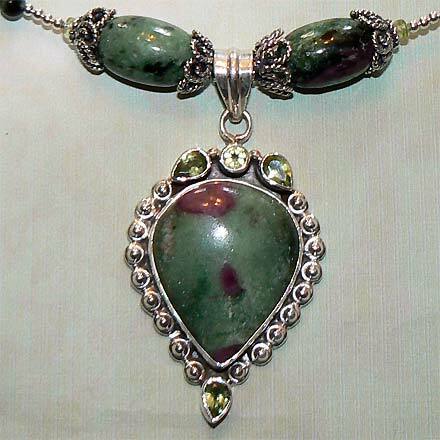 Sterling Silver Ruby in Zoisite and Peridot Necklace. 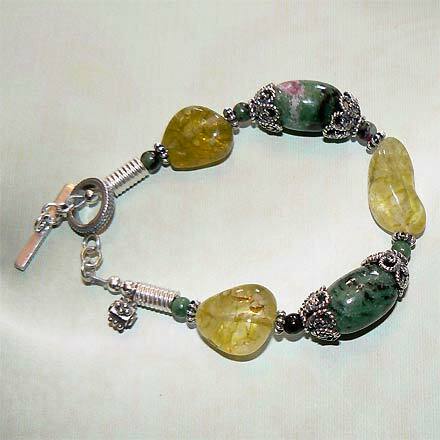 Sterling Silver Ruby in Zoisite and Peridot Bracelet. Sterling Silver Ruby in Zoisite and Peridot Earrings. A garden of gems: Peridot and Rubies grow in a Zoisite field. Zoisite is a green and black stone that often comes with Ruby inclusions. This jewelry set is also highlighted with Peridot. You’ll love the big chunky quality of both the Zoisite and Peridot in the bracelet and necklace, the latter which also comes with a Peridot clasp. For those who are interested in Astrological significances of stones, Zoisite corresponds with Aries and Peridot corresponds with Libra and with the month of August.